UFOTV.com presents the 12 November 2007 UFO press conference, UFO Close Encounters (held at the National Press Club (NPC) in Washington, D.C.). The conference was organised by filmmaker James Fox and investigative journalist Leslie Kean of the Coalition for Freedom of Information. 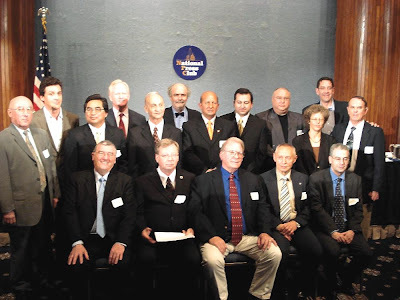 In November 2007, the UFO press conference was also called “International Press Conference” by MUFON and other well-known UFO groups/websites. The following speakers participated at the 2007 International Press Conference: John Fife Symington III, U.S. businessman and former Arizona Governor; John Callahan, former Federal Aviation Administration (FAA) Division Chief of the Office of Accident, Investigation and Prevention; Charles I. Halt, Colonel, USAF (Ret. ); James Penniston, Sergeant, USAF (Ret. ); Nick Pope, former UK Ministry of Defence official; Wilfried De Brouwer, Major General, Belgian Air Force (Ret. ); Parviz Jafari, General, Iranian Air Force (Ret. ); Dr. Anthony Choy, Founding Member OIFAA, Peruvian Air Force; Oscar Alfonso Santa Maria Huertas, Commander, Peruvian Air Force (Ret. ); Rodrigo Bravo Garrida, Captain for the Army of Chile; Ray Bowyer, Captain, Aurigny Airlines; Jean-Charles Duboc, Captain, Air France (Ret. ); Dr. Jean-Claude Ribes, Astrophysicist, France and Dr. Claude Poher, Engineer, Astronomer, Astrophysicist, France.